Challerhocker for sale. Buy online at Zingerman's Mail Order. Gourmet Gifts. Food Gifts. The latest, greatest mountain cheese. Essentially Swiss Appenzeller made to a more traditional recipe—one with more flavor. A raw cow’s milk cheese that’s washed in wine and aged for about a year and, like other great European mountain cheeses, it's nutty and sweet with a fruity finish. It’s amazingly creamy for a cheese of its age with fantastic depth and long lingering flavors. 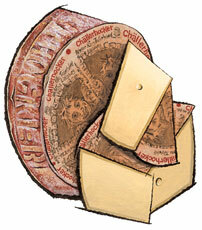 Our current wheels of challerhocker have a deep, savory character, like salty roasted cauliflower.